Webmaster and NinerNewbie Need Your Help!! As many fans of our forums already know, the Webmaster of 49erswebzone.com and his girlfriend got engaged about 6 months back. Both he and his new fiancé have been very busy with other aspects of their lives so finding the time to actually plan the wedding has been somewhat difficult. 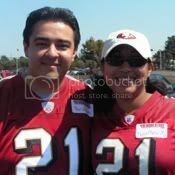 However, his fiancé (known as NinerNewbie on the 49erswebzone.com forums) found a wonderful contest sponsored by MYfm 104.3 that is giving away a free wedding and honeymoon, all expenses paid. The catch is that the wedding will take place in one week following the end of the contest. So the Webmaster and NinerNewbie decided to give it a try and are asking for members, visitors, fans and friends of 49erswebzone.com to cast their vote. Once signed up, you can vote daily. Phase One of the vote will be to get into the Top 10. Beginning Monday, July 5, 2010 at 6:00AM PST, the public will be allowed to vote online from all the eligible entries by logging on to 1043myfm.com . Photos will be arranged in random order. Top 10 finalists with the highest votes will move on to Phase 2 Online Voting. Deadline to vote in Phase 1 is 5:00PM PST on Friday, July 16, 2010. Voting is limited to one vote per verified email address per day for the voting period. AOL Users: Due to AOL spam filters, you will not receive a confirmation email and therefore, your vote will not be counted. In order to participate in the voting portion of the contest, you should use an alternate email account. There are many free email services widely available across the internet.